Please donate to our sharks appeal today! If you have been fortunate enough to swim in Galapagos, you may have seen the majestic grace of a shark gliding through the clear, blue water. Or you may have seen the murky, but mysterious, sight of a shadow swimming along the edge of a mangrove forest. Sharks have survived all five mass extinctions, including the most devastating one 250 million years ago which killed 96% of marine life. However, today, it is estimated that 100 million sharks are killed globally every year either through fishing or accidental deaths caused by humans. Galapagos is famous for its sharks. 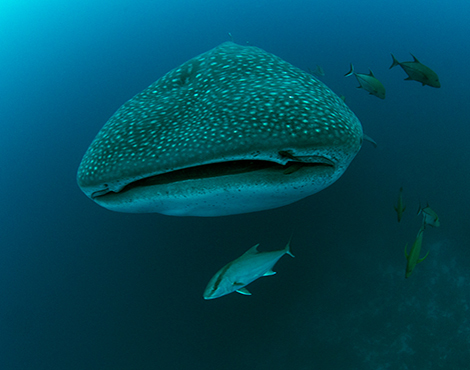 The Galapagos Marine Reserve (GMR) is rich with marine life and is one of the few places left in the world with such a high number of sharks. We want to ensure that the sharks in the GMR are protected for future generations. And we need your help. 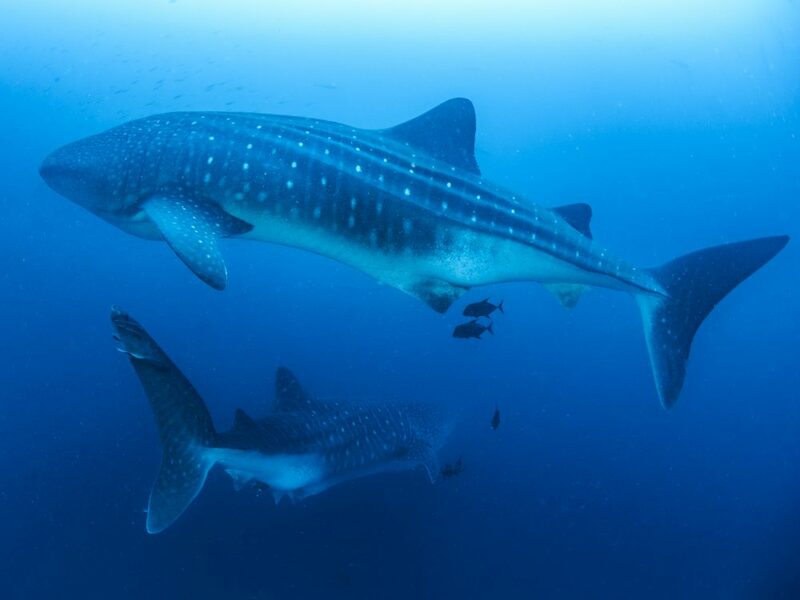 Many of the shark species found in the GMR are migratory, including endangered species such as silky, scalloped hammerhead and whale sharks. While we are still learning where they go and why, we do know that a number of species follow the Cocos-Galapagos underwater ridge to Cocos Island National Park in Costa Rica. The minute the sharks leave the GMR they are no longer protected against their main threat – fishing. 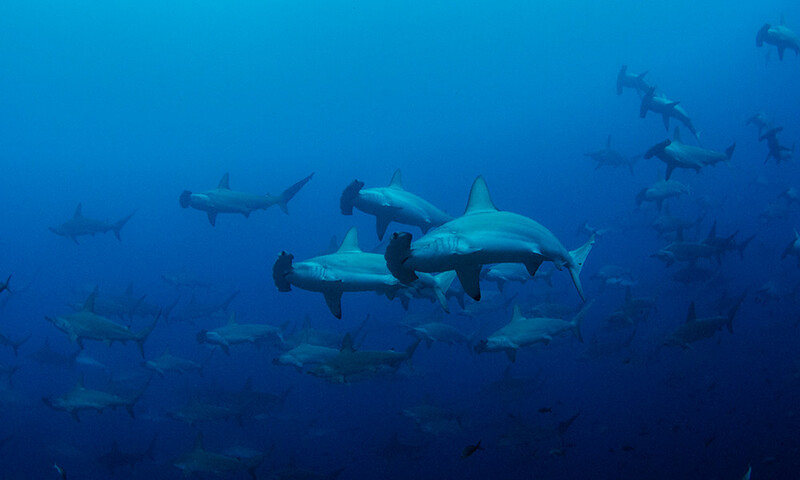 The ocean between Galapagos and Cocos is a popular place for industrial fishing fleets to work, including those who focus on harvesting shark fins often destined for the Asian market. In 2017, one Chinese vessel was found having strayed into Galapagos waters with over 6,000 individual dead sharks, including a large number of endangered species. There is urgent need for better protection outside of the GMR, and we need your help before it is too late. Research that we supported successfully resulted in the creation of a ‘shark sanctuary’ in 2016 around Darwin and Wolf islands in the north of the GMR. We are now raising funds to help our partners gather the evidence needed for the creation of a protected ‘swimway’ between Galapagos and Cocos. This will be done by tagging sharks to see where they travel, whilst remote underwater cameras will allow us to improve our understanding about which species are found in the proposed swimway area. This evidence is vital for the creation of this swimway and the conservation of sharks. It is a huge task but by creating this protected swimway and sheltering sharks from the effects of industrial fishing during their migrations, we know that we will be giving species like the endangered scalloped hammerhead shark a chance of survival. Please help us today! Yes, I would like to make a donation to help ensure a future for sharks in Galapagos! 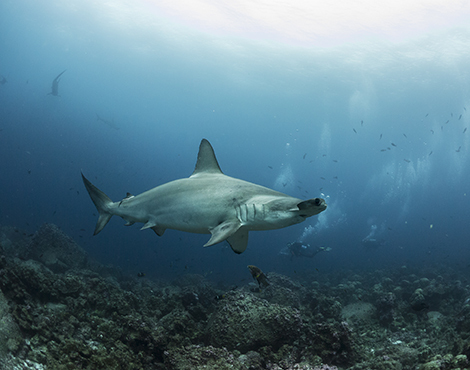 The programme aims to protect sharks in Galapagos throughout their lifetimes. Do you want to know more about the scalloped hammerhead shark? 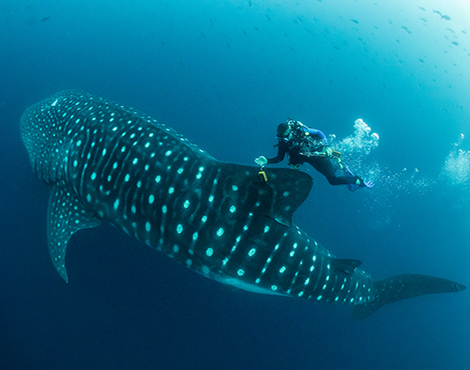 Would you like to learn more about the whale shark?